Tibet is termed an "autonymous region" of the People's Republic of China by that country's government. It is frequently in the news, as well it should be, since its brutal occupation by the Chinese represents the biggest land grab in recent history, as well as one of the most reprensible modern examples of cultural and political repression. As an independent nation, Tibet produced 18 stamps (plus varieties) from 1912 until the Chinese invasion in 1950. 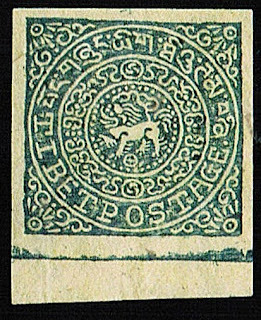 The stamps were printed on rough native paper, and inclusions are normal, and do not detract from the value unless they seriously obstruct the design or have seriously damaged the paper. While printing quantity information is not available for these issues, I would conservatively estimate that no more than a few thousand of the scarcest stamps were produced, and that quantities issued on the others range upward into the low tens of thousands. Unfortunately, excellent counterfeits exist, so I recommend focusing on the most expensive of the Tibetan stamps (those that catalogue $250 or more), and requiring expertization as a condition of purchase. 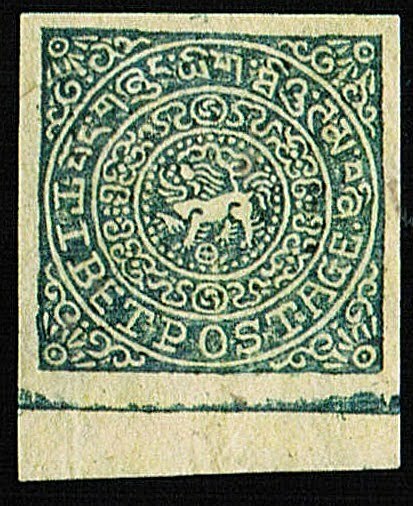 While there are only about 3 million Tibetans (probably not enough to sustain a strong demand for their stamps), the stamps of Tibet also appeal to specialists in Europe and the U.S. . In addition, there is also a potential market among the millions of people throughout the world who either have an interest in Tibetan Buddhism or who sympathize with the cause of Tibetan Independence. The stamps remain undervalued because of the ubiquity of counterfeits and the consequent cost and inconvenience of obtaining certificates. As in similar cases with certain other countries' stamps, the cream will eventually rise to the top. "It is frequently in the news, as well it should be, since its brutal occupation by the Chinese represents the biggest land grab in recent history, as well as one of the most reprensible modern examples of cultural and political repression." As an ethnic Chinese, I found this is very offensive. It shows that you obviously don't respect the Chinese people and their nation. Please be more respectful of the Chinese people and the Chinese nation in your articles. Can you imagine how would you feel if I give comments similar to this to the American expansion to the West in the 1800's? Didn't the White Americans also "grabbed" a lot of cheap lands from the Native Americans? I found this article is very insulting to the Chinese people and nation. I am demanding an apology from the author of this blog. How to you think Tibetans felt when they were invaded by Chinese troops and killed in their thousands, their monasteries destroyed and their culture ravaged. It is the Chinese who should apologise. The Chinese always say that Tibet is part of China. Then why do they treat there own people in this way? I am an ethnic Chinese and I agree 100 percent that what China is doing to Tibet and the Tibetans in reprehensible.